The Maria’s tradition began in 1952 when Maria and Gilbert Lopez started a small take-out kitchen in the area that now houses our bar and fine kitchen. 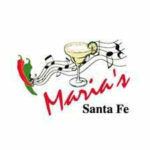 Maria’s traditional Northern new Mexico cooking soon became such a hit that Gilbert built a patio. But the rains were relentless that year, so Gilbert covered the patio with the very vigas and roof that are still in place today, in what we now call “The Cantina.” This was the beginning of a restaurant which has built a history unto itself and has become a Santa Fe landmark and showplace.